NEW! OUTREACH PROGRAM PROCEDURES EFFECTIVE JANUARY 2019. Click Here for a summary of changes. Outreach trainers must retain Outreach class records for 5 years. OSHA reserves the right to request copies of class records for verification purposes at any time. Please note that failure to keep or provide these records may result in corrective action, up to and including the revocation of Outreach trainer status. Sign-in sheets must be completed for each day of class. Printed or typed names must appear adjacent to the students’ signatures. This is the location where the Outreach trainer will send the student card; it must be the student’s home or business address. A copy of the documentation submitted to request student course completion cards including the list of the topics taught and the class time spent on each topic. 5. Student Course Completion Card Numbers. Outreach trainers must make a copy (electronic or paper) of every course completion card they issue, after entering all information onto the card. This will enable the Outreach trainer to track the card number issued to each student. A list containing the name of each guest trainer, topics and times covered by each, and their qualifications. A list containing the name of each additional Outreach Trainer, a list of the topics covered, the number of contact hours allocated to each topic, and a copy of their Outreach trainer card. Outreach Training Report Submission and Card Requests: All reports must be submitted online. Must be able to upload a copy of your Outreach Trainer Card. You will be contacted after your request. DO NOT PAY UNTIL YOU HAVE BEEN CONTACTED! Copy of Reciept Showing Payment. Click here to pay. A copy of the original card. Copy of the receipt showing payment. Click here to pay. The outline must indicate the course title, location, and the actual date and time period (e.g. 1 p.m. to 2 p.m.) of every topic delivered, and include all breaks and meal periods. 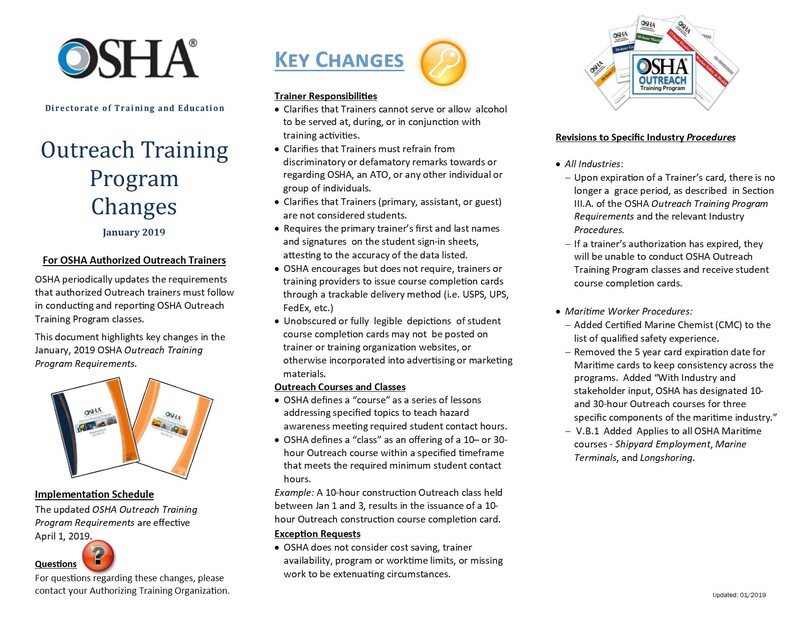 The primary and assistant OSHA Outreach Training Program authorized trainers and any guest trainers (see Section V.M. ), must be listed on the topic outline next to the topic(s) they instructed.